New Delhi: Electric mobility powered by renewable energy could be key to fighting climate change, the 24th Conference of Parties (COP24) in Poland has highlighted. For India, the world’s third-largest automobile market, electric vehicles (EV) are an imperative. Some 25 million conventional vehicles--with internal combustion (IC) engines--were sold here in 2017, adding to a 230 million passenger vehicle fleet, which trebled in size from 2001 to 2016. Globally, transport accounts for a quarter of total emissions, and India’s vehicle emissions have contributed to giving the country the worst air quality in the world. By taking 1.24 million lives, air pollution was responsible for one in eight deaths in India in 2017, as IndiaSpend reported on December 7, 2018. Yet, India is likely to have twice as many vehicles on the road by 2040. Having suggested an ambitious plan to go all-electric by 2030, the government has quietly beat a retreat to say it aims to ensure that by 2030, at least 15% of the vehicles in the country are electric. The reversal acknowledges the challenges ahead, and a decision to proceed cautiously. It proposes to do this by providing subsidies and a range of other incentives such as tax breaks, especially to two-wheelers and public transport vehicles such as three-wheelers and buses. A new policy long in the works and reviewed by IndiaSpend seeks to provide clarity on the direction the government aims to steer the industry in, including domestic manufacturing as against import; the kind and extent of charging infrastructure to be set up; and how subsidies and tax incentives will be financed. Here’s a look at where India’s EV sector stands, and what must be done for it to take off. An electric car emits 25% less CO2--the most common greenhouse gas--than a diesel car over its lifetime even in countries with “dirty” (predominantly coal-fired) grids such as India, according to a December 2018 report by the World Bank on electric mobility launched at the COP24. India’s grid, however, is turning green rapidly: Renewables now account for one-fifth of installed power capacity. India had 448,000 electric vehicles on road as on March 2018, 90% of total sales (475,000 vehicles) being two-wheelers. Some 7,000 are four-wheelers and 150 heavy electric vehicles, such as trucks and buses, as per the Society of Manufacturers of Electric Vehicles (SMEV). There are also some 1.7 million electric three-wheelers, mostly e-rickshaws, with 850,000 of them (48%) having been sold within the last financial year 2017-18 (April 2017-March 2018). Leading EV manufacturers include Hero Eco, Mahindra Reva, Electrotherm, Avon, Lohia, Ampere making a range of electric vehicles--scooters, cars (hybrid and full electric), buses, mini pickup trucks, rickshaws, cycles--available for sale. In the electric car segment, following the lead of Mahindra Reva, the Indian unit of South Korea’s Hyundai Motor Co. Ltd and Maruti Suzuki will launch EVs in 2019 and 2020, respectively. Tata Motors is also looking to enter the EV market in 2019, Mint newspaper reported in June 2018. A range of businesses are emerging along the supply chain--sourcing or manufacturing raw materials, battery cells, battery packs, integrated vehicles, sales, recharge and services, and so on. Ever since the government announced the 'National Electric Mobility Mission Plan 2020' (NEMMP) in 2013, the industry has enjoyed point-of-sales subsidies, tax concessions and funding to develop charging infrastructure. NEMMP targets sales of 6-7 million sales of hybrid vehicles (that run on both electricity and conventional fuel) and all-electric vehicles every year from 2020 onwards--roughly 25% of all new vehicles. This would require a massive jump from the 900,000 EVs sold in 2017, just 4% of IC engine sales that year, as IndiaSpend reported on September 17, 2018. The Faster Adoption and Manufacturing of Hybrid and Electric vehicles (FAME) scheme, launched in 2015, took tentative steps towards promoting technology development, creating demand through subsidies, conducting pilot projects and setting up charging Infrastructure. Due to be renewed in 2017, it has been extended three times, keeping the industry waiting for a more comprehensive FAME-II that would enable the industry to scale by driving mass adoption for public transport as well as for private use. It would also create charging infrastructure, promote R&D of EV technologies and push for domestic manufacturing. Meanwhile, some recent developments are a good signal: Electric quadricycles, which until recently were illegal because they could not be registered under the Motor Vehicles Act (mandatory for any vehicle that plies on public roads), have now been allowed to get registered. These could soon replace (or supplement) diesel- and CNG-powered auto-rickshaws, much in use in smaller cities and towns and offering last-mile connectivity in large cities, too. Benefits available for battery-makers have now been restricted to lighter and more efficient lithium-ion and other fast-charging batteries, which will see the less efficient lead-acid batteries gradually disappear from the EV sector while boosting the manufacture and purchase of efficient batteries. “Having electric quadricycles registered as passenger vehicles and removing EVs with conventional battery from the ambit of FAME-I scheme will help drive innovation and research towards cheaper and better performing EVs,” Shantanu Jaiswal, head of India research at Bloomberg New Energy Finance, told IndiaSpend. Meanwhile, six state governments now offer land and tax benefits to manufacturers in the EV sector--Karnataka, Maharashtra, Kerala, Uttar Pradesh, Andhra Pradesh and Telangana. More state governments are expected to follow suit. Many manufacturers, suppliers and service providers who are waiting for a clear policy have had to put their investment on hold while the government finalises FAME-II. “After four extensions, FAME-I has almost sluggishly stagnated at a point where it has lost its relevance,” Sohinder Gill, chief executive officer of HERO Electric and the director-general of SMEV, told IndiaSpend. Much will depend on how much subsidy will be provided on the upfront price of a vehicle; whether charging stations would adopt the fast-charging or battery-swapping model; whether subsidies will be provided for manufacturing batteries domestically or will it continue to be cheaper to import batteries, and so on. Industry insiders say the key issue holding up FAME-II is money--how the various subsidies, tax breaks and funding support will be financed by the government. Even a modest feebate--a combined “fee” and “rebate” where a fee is levied on one player to provide a rebate to another--could potentially generate enough funds to enable the EV sector to take off, Gill said. For instance, if every IC engine two-wheeler priced at Rs 60,000-70,000 pays a 1.6-1.7% feebate of Rs 1,000, it would create a pool of Rs 2,000 crore in a year (assuming sales of 20 million units), an SMEV analysis shows. The idea of a feebate is fairly popular among research organisations. It “could be a robust way of financing subsidies for EVs, which are essential to fund demand incentives provided by the government”, researchers at the Council on Energy, Environment and Water (CEEW) told IndiaSpend. They said Delhi state's draft EV policy has already proposed a feebate. Battery swapping or fast-charging infrastructure? The government has been trying to decide whether charging stations should adopt the fast-charging or battery-swapping model, or both. “Charging infrastructure will not be one model over the other that will be preferred, but, a combination of both that will help in serving diverse EV segments,” CEEW researchers said, adding that battery swapping would be more suitable for three- and two-wheelers while fast charging would be preferred by fleet operators and commercial vehicles. Another point of contention regarding charging stations is whether they will be treated as a service provider (providing charging service) or a seller (of electricity). The Electricity Act allows only power distribution companies to sell electricity, so it would have to be amended if the latter view is taken. Since the bulk of sales under FAME have been in the hybrid segment, the IC automobile industry has not felt an impact. But FAME-II is likely to subsidise only 100% electric vehicles, Amit Bhatt, strategy head for integrated urban transport at World Resources Institute India (WRI India), told IndiaSpend. Conventional automobiles consume 30% of petroleum produced in refineries. While EVs have about 20 parts, IC engine vehicles have 2,000, The Hindu Businessline reported on December 11, 2018. Together, the oil and auto-parts industry will be formidable opponents of the EV sector, it said. Being developed by the NITI Aayog, the government’s think-tank, FAME-II is likely to be more comprehensive and forward-looking, as it will bring together voices from all stakeholder ministries--heavy industries, road transport, urban planning, power, and renewables. FAME-I, by contrast, was solely developed by the ministry of heavy industries, which restricted its scope. 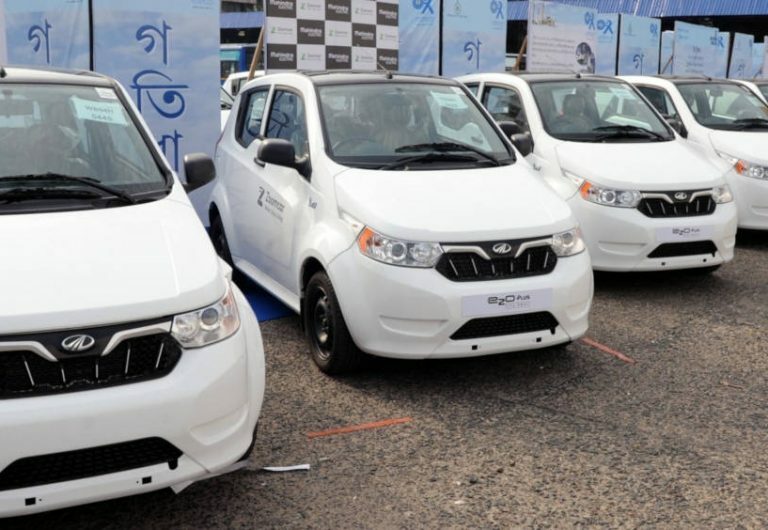 FAME-II would focus on turning electric all intra-city commercial transport, such as three-wheelers and taxi and bus fleets, according to government documents reviewed by IndiaSpend. Two-wheelers account for 80% of annual automobile sales in India, and FAME-II would subsidise electric two-wheelers. Subsidies, especially if enhanced, could be a game-changer as currently customers only choose EVs over ICs if they are cheaper. “There is still a wide cost gap between electric and non electric vehicle, which despite subsidies and tax rebates is not getting bridged,” Gill of SMEV said. For example even after subsidies, an electric two-wheeler costs Rs 30,000 more than the closest IC engine option. Plus the EV has a maximum speed of 45 km/hour and cannot travel intercity. “The only way it can be resolved is if the government and the industry, at least for one or two years, somehow lower the acquisition price of EVs to make it attractive against IC engine. And make it a very limited-time offer,” Gill said. This could convert 1-2 million IC engine buyers into EV buyers annually, he estimated. EVs would get greater tax relaxation, possibly by further reducing or rationalising GST for EVs. Currently, a 12% GST applies on EVs, as against a 28%-plus GST on petrol and diesel cars and hybrid vehicles. The new EV policy could also ease the permit regulations suggested in the Motor Vehicle Act, which currently allow only a limited number of commercial vehicles on a given route. Lifting these restrictions would enable more green vehicles into the commercial vehicles segment. Green number plates provided to registered EVs would entitle them to special parking slots, toll waivers, lower road taxes and registration charges, among other benefits. In another first, 16- to 18-year-olds could be given licenses to drive electric two-wheelers. Currently, only people older than 18 years can acquire a driver’s license (although learners’ licenses are open to 16-year-olds).